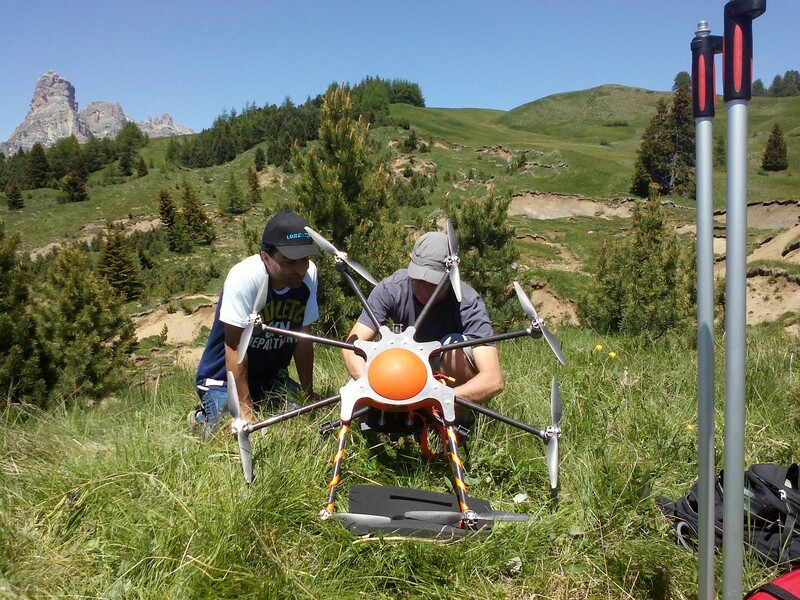 In the frame of the LEMONADE project, EURAC – Applied for Remote Sensing Institute performed the UAV flight campaign on the 23.06.2016 aiming to produce high resolution orthomosaics, 3D point clouds as well as Digital Surface and Terrain Models. The UAV was flying exactly the same area, considered as the most active part of the Corvara landslide (i.e. 13 hectares on air) covered in 2015. The original flight plan consists of five different flights, each of them 200 m long, 80 m wide and 60 m height. Unfortunately, during the flight campaign of this year we faced technical difficulties because we were not able to transmit the flight plans into the automatic flight controller mounted on the UAV (control system that follows a pre-programmed GPS point route). Since one single field campaign takes a lot of effort, organization and time, the pilots decided to flight in manual mode, i.e. controlling elevation, orientation and speed during each flight. The general consideration that we agreed was to keep (i) the height of 60 m and (ii) the straight lines with the support of one observer standing in the opposite side of the landslide. The digital camera was configured to acquire one image every 2 seconds according to a flight speed of 5 m/s what gave us some images every 10 m approximately. In order to retrieve reliable results and decrease the effect of the manual flight mode, four flights were done using the same orientation and one in the orthogonal orientation. We were able to collect 1190 images that were preliminary pre-processed to confirm the overlapping coverage. This task consisted on filtering images, converting images from raw to tiff (using Rawterapee software), assigning position to each image, and finally doing the first processing step on Pix4D software (e.g. keypoints and coarse cloud point generation and first derived digital surface model).